Wow, now you're really ready to go. You've got a site, collected your tinder, kindling, and fuelwood and now you just need to put it all together. So, how are you going to build your campfire? The way you assemble your wood before lighting it is called the Fire Lay and there are a few classic methods to use, depending on what you will use your fire for. I nearly always start with a teepee unless I've been asked to create a large council fire for entertainment. Plan where you will light it - leave an opening to reach the tinder. Light the upwind side so the wind blows the flame into the fuel. Leave air space between pieces of wood. Build UP, not OUT. Create a higher pile of wood rather than a flatter pile. This is my favorite and I believe the most useful and easiest to light. The key is to stick a few sticks into the ground to supply support for the rest of the kindling. Place your tinder bundle on the ground or on a small piece of bark. Stick three or four kindling twigs in the ground to form a teepee above the tinder. Lean small kindling twigs against the downwind side of the tinder. Leave an opening on the upwind side all the way to the center tinder where you can light the fire. Continue to lean twigs around the teepee structure. Work your way up to pencil-sized sticks, leaving plenty of air space between sticks. Lean some smaller fuelwood pieces against this support structure. Have additional small fuelwood and kindling ready in case it is needed. This style produces a fast flame and quickly falls into itself in a pile of coals. The heat is directed up to a single point and is useful for boiling water in a single pot above the teepee. Once the teepee collapses, fuelwood can be laid around it like a log cabin or just criss-cross on top of the flames. This is the most popular style for beginners to build - I don't know why, maybe because it looks like a house? Anyway, I tend to not use it because it is difficult to access the interior. But, I do add wood to a burning teepee fire to turn it into a log cabin. Lay a small teepee fire. Lay two larger pieces of fuelwood parallel on opposite sides of the teepee. Lay two slightly smaller pieces of fuelwood parallel on the other two opposite sides. Leave a space under the upwind piece through which you can reach the tinder to light it - you might need to fashion a mini-torch and stick it in to light. Continue to lay smaller and shorter pieces to form a cabin or pyramid shape. Have extra kindling ready to drop into the top or through the spaces on the sides to feed the internal fire until the outer walls catch fire. This kind of fire makes good coals and is a classic campfire look. Getting it lit is the challenge. This fire keeps air space open due to the support stick and a steady, light wind really helps it get started. Stick a long, large piece of kindling in the ground at a flat angle. It should point into the wind. Place your tinder bundle under the stick. Lean very tiny pieces of kindling on the tinder bundle. Lean more small kindling against the support stick. Lean larger kindling against the first layer. You could create a second lean-to of larger sticks over the first lean-to. This is fun to light, but the most common challenge is burning up all the tinder without catching the kindling because too much air space is left open. Once it gets going, it's fun to anticipate the main support stick burning through and falling. The big daddy of large group campfires. A council fire burns hot, bright, and for a long time without adding more wood. It does take bigger logs and is meant for entertaining big crowds. Lay 4 logs, each about 5 or 6 inches across and 3 to 3.5 feet long, with about 4 inches of air space between logs. Across these, lay a platform of about 6 logs, each about 5 inches across and 3 feet long. Across this, lay a layer of 4 inch logs, 2.5 feet long. Then, two layers of 3 inch logs, 2 feet long, in perpendicular layers. Then, 2 layers of 2 inch logs, 2 feet long. Then, 2 layers of 1 inch split wood, 18 inches long. 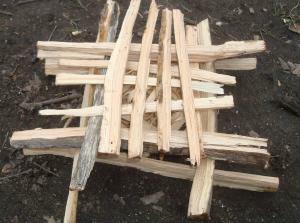 Make a lot of split kindling sticks and stick them into any open air space in the log layers. 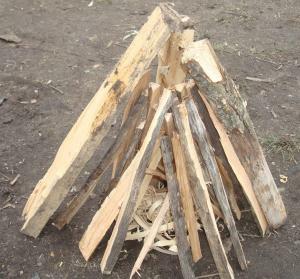 Create a teepee structure on top of the last layer of split wood. Leaving a space to light the teepee, continue placing more split pieces around the teepee to make a few more layers. The teepee is lit and the fire burns its way down through the layers. This fire maintains good flame for a long time as burning fuel drops down into the larger pieces of wood and ignites them. There is no large structural collapse as you might get with a log cabin. Good for cooking and has good wind protection. Not useful for entertaining or warming. Retrieve two short logs 6 to 8 inches in diameter and place them nearly parallel to each other about 6 inches apart at one end and 3 inches at the other. Create small teepee fire between the logs and feed it fuel until there are good coals. Use the two logs as a platform on which you set your pots to cook. Spread or pile the coals to create hotter and cooler cooking areas.